Foundation president and CEO Lee Roper-Batker pronouncing the Young Women’s Initiative of Minnesota. Photo Courtesy of Office of the Governor. 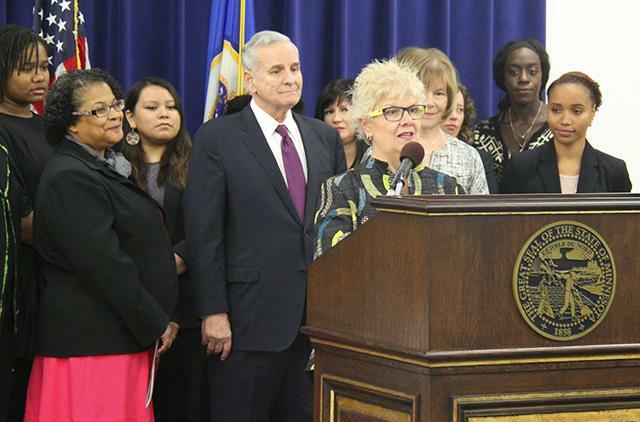 The Young Women’s Initiative of Minnesota, an initiative to close racial and gender gaps, was unveiled by Gov. Mark Dayton and Lt. Gov. Tina Smith, according to a report from Kristoffer Tigue on MinnPost’s Community Sketchbook. It focuses on improving quality of living for women of color, women in Greater Minnesota, women identifying as LGBTQ and women with disabilities, all between the ages of 12 to 24. Furthermore, it will be the nation’s first private-public union in fighting racial-gender disparities. Read more about the initiative over at MinnPost. Protesters gathering outside Minneapolis City Hall. Photo courtesy of Chris Dang, Minnesota Daily. 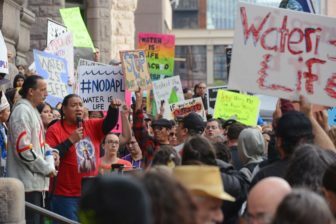 Kevin Beckman and Melissa Steinken of Minnesota Daily report that more than 200 demonstrators met outside the Hennepin County Courthouse, supporting the protestors of the Dakota Access Pipeline. Amongst the demostrators were members of Black Lives Matter. Read more on the issue over at Minnesota Daily. Luz Maria Frias. Photo courtesy of Minnesota Women’s Press. Mary Turck of Minnesota Women’s Press reports on The Minneapolis Foundation’s former Vice President Luz Maria Frias and her efforts to further endorse intercultural communication. Read the whole profile over at Minnesota Women’s Press. Virtually unnoticed in the cacophony of the Trumpian news cycle, a bill to place more power in the hands of police slithered through the House of Representatives with overwhelming bipartisan support – including from such progressive Democratic luminaries as Luis Gutiérrez, Raúl Grijalva and Keith Ellison. The “Serve and Protect Act” (H.R.5698) comes packaged as a necessary measure to protect our brave officers “who put on the badge every day to keep us safe” from the dangers of an imaginary “War on Police.” Specifically, it would impose prison terms of up to ten years for harming or attempting to harm officers of any local, state or federal agencies of what is euphemistically called “law enforcement.” If convicted of carrying out or attempting a kidnapping or killing of an officer, the accused could be imprisoned for life.